Leonard Cohen's 'You Want It Darker' Is A Family Affair : World Cafe The album, one of the 82-year-old's best, was produced by his son Adam, who joins World Cafe to discuss what it's like to work with a living legend who just happens to be your dad. Leonard Cohen (left) and Adam Cohen speak at an event for the release of You Want It Darker. Leonard Cohen's new album, You Want It Darker, certainly delivers on the promise of its title. It's a meditation on mortality that soars to the highest of musical heights and sinks to the lowest of vocal and existential depths. 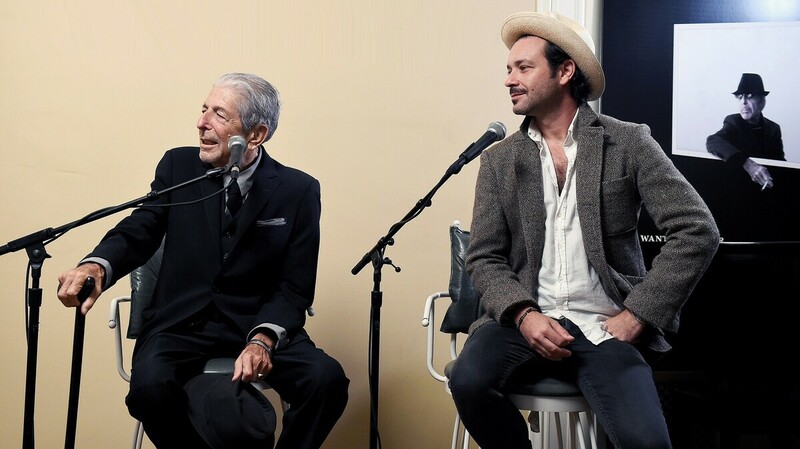 The record is truly one of the 82-year-old Cohen's best — and it was produced by his son, fellow musician Adam Cohen. The experience saw Adam flying to Montreal to record the congregation of his family's old synagogue, dancing in front of speakers with his old man and delving deeper into a father-son relationship than most of us couldn't dream possible. In this interview, hear Adam discuss the pressure — and the joy — of producing a record for a living legend who just happens to be your dad.